The convert airtime to data option is offered by all three major cellular networks – MTN, Vodacom and Cell C in South Africa. It can be used whether you are a pre-paid, top up or contract customer. Converting your airtime to data bundles is a great way to connect to the internet, access your email, browse Facebook and other social media sites or find new games online. As your data is converted from airtime, this means that you can stay connected using your airtime balance and it also is a cheaper option in most cases than using your regular airtime for data. In this guide, we will show you how to convert airtime to data bundles on the Vodacom network. Check out these posts to convert MTN data to airtime or to convert Cell C data to airtime . SMS: Send a free SMS from your cellphone with the Data Bundle size you want to buy to 100. For example: ‘MyMeg 250’. Website: Login to the Vodacom.co.za website with your Vodacom number, and click the ‘Purchase data bundles’ option in the useful links menu. Call: Dial *111# and follow the menu prompts or options that are provided. ATM: Selected banks allow you to purchase data from ATMs. The data value you select will be automatically credited to the phone number that you enter. 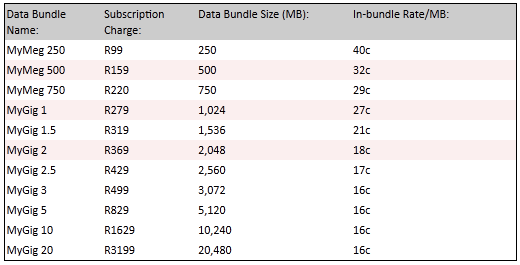 Vodacom data rates are charged at a subscription fee as well as in-bundle rates per MB or GIG. Once you have compared the data pricing plans available and selected your data purchase method, you can easily convert airtime to data with your current mobile network.